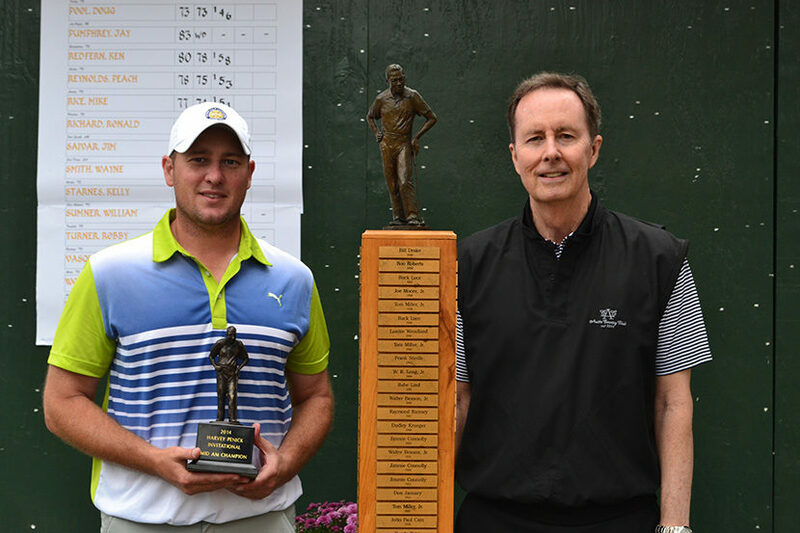 Kenny Cook and John Grace are the newest Harvey Penick Invitational champions. 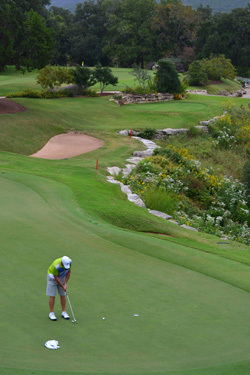 Both players rode second-round 68’s to big leads heading into the final round, and despite Austin Country Club’s reputation as a difficult course to play with the lead, both players cruised to convincing wins. Cook, the 2011 U.S. Mid-Amateur runner-up from Noblesville, IN, held a five shot lead over three players: Colby Harwell of Robinson, TX, a member of the victorious Texas team at last week’s USGA State Team Championship; Shane Sigsbee of Las Vegas, NV; and Chris Hartenstein of Austin. Harwell edged a shot closer with a chip-in birdie at the difficult par-3 2nd, while John Ehrgott of Edwards, IL birdied 3 and 4 to get in red figures. Cook pulled his tee shot into the water on the par-4 4th hole and had to make a 10-footer for a bogey, and when he then bogeyed the 6th hole it looked like he might be coming back to the field. But a close iron shot on the par-3 8th righted the ship while the chasers struggled to make enough birdies. Still, defending champion Brian Noonan made a late push, and when Cook three-putted the par-5 15th hole for par, the lead was down to two after Noonan and Harwell both birdied the 17th. On the 203-yard par-3 16th, Cook hit the defining shot of the tournament, hitting it to within 6 feet and converting the birdie putt. A second straight birdie on the par-5 17th gave him a four-shot lead, which was the final margin. Cook finished at 210, 6 under par for the tournament. Noonan (69) was solo second at 2-under 214, with Harwell (72) and Ehrgott (70) tied third at 215. Sigsbee (75) finished tied fifth with Michael Slaven (73) of Chicago, IL. 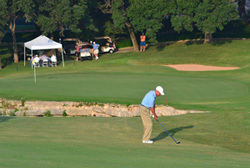 In the Senior Division, John Grace of Fort Worth entered the final round with a six shot lead over Mike Peck of Irving, TX. Grace, a former Walker Cupper and a former U.S. Amateur and U.S. Senior runner-up, is no stranger to closing out big tournaments–he is the only player to have won the Texas Amateur, Texas Mid-Amateur and Texas Senior Amateur titles, and last year was inducted in the Texas Golf Hall of Fame. His lead was still six at the turn, only with 2012 champion Jeff New of Scottsdale, AZ as the chaser. But Grace left the field behind on the back nine, with birdies on the 10th, 13th, and 17th leading to a closing 69, his third straight round in the 60s. 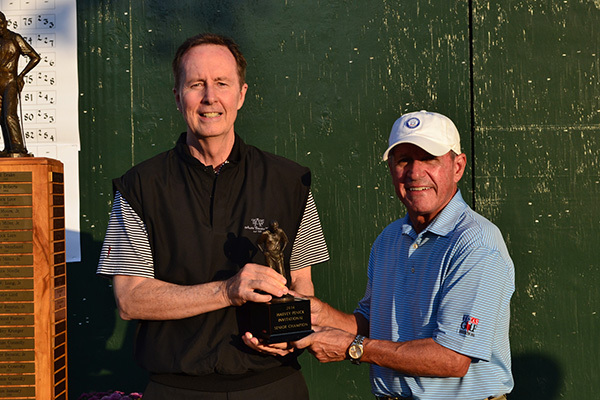 The 66-year-old Grace finished with rounds of 69-68-69 for a senior tournament record 10-under par 206, and a ten shot win over defending champion Bob Kearney of Houston, who closed with a 70 to finish at even par for the tournament. New (73) and Peck (74) finished tied third at 1-over 217, with Mike Allen of Austin (72) fifth at 218. Thanks to all players who participated in the tournament this year. Thanks also to Bobby Stringer and his staff who once again brought the golf course to championship condition. And a special thanks once again to Tinsley Penick, Harvey’s son and former longtime professional at Austin Country Club whose presence this week made the event that much more special. With the Austin Country Club course scheduled to undergo an extensive course restoration this winter, the 78th edition of the Harvey Penick Invitational will be played no earlier than the fall of 2016. During the restoration project, the greens will be rebuilt to original specifications and lost green space will be recaptured. In addition, the teeing grounds will be rebuilt, the fairways regrassed, and the rough areas homogenized. Rod Whitman has been hired to oversee the restoration project. Mr. Whitman is a longtime associate of Pete Dye, and was one of the main persons who shaped the original course alongside Mr. Dye in 1984.